If you asked our mechanics, other Porsche enthusiasts, and even your everyday joe who doesn’t care much about cars what the most popular Porsche is, you’d get the same answer time and time again: the 911. It’s no secret that Porsche’s most iconic model is also their best-looking and fastest, and it’s also no secret that the 911 has, by far, the most variations of itself. Heck, according to a February 2018 article from Business Insider, there were 24 distinct versions of the 911 available for purchase. Twenty-freaking-four of them. Of course, that doesn’t include any of the old, classic, or simply no-longer-brand-new models out there. There are hundreds and hundreds of 911 variations since the inception of the Porsche’s flagship, and now our mainstay automotive brand has another series of brand new models for your driving pleasure. That’s right — Porsche’s back with the 992-generation 911 that’s leaner, meaner, and better-equipped than ever before. Though we haven’t seen one of these bad boys roll through our independent Porsche repair shop in Los Angeles quite yet, we’re sure to see one sooner or later…and we can’t wait for that day. Let’s take a high-level look at the new generation of the 911. For those who enjoyed or are currently enjoying the 991.2 generation of the 911, you’ll likely appreciate that the 992 platform is similar, but improved. 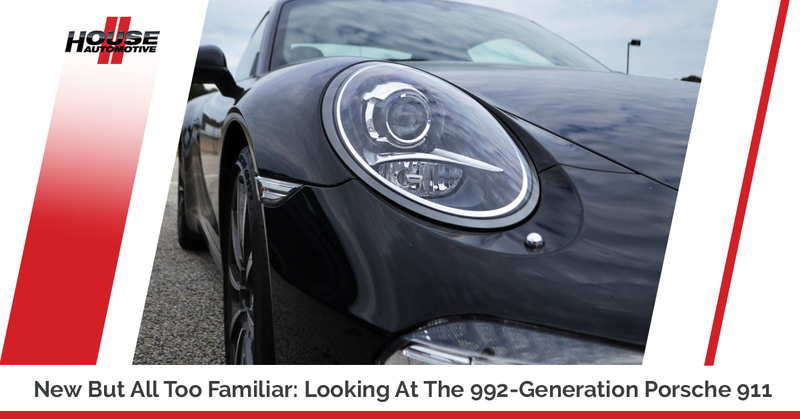 Now, you would expect any new version of a vehicle to be improved at least somewhat, and we see that with an updated drivetrain, interior, exterior details, technology/features, and overall design with the 992 generation. We’ll admit; that last line sounded like it came from a YouTube car reviewer. Until this point, Porsche’s PDK transmission system was only fitted with seven individual speeds that shift with the mere blink of an eye. While we’d argue that a true manual always provides a better driving experience (and more control), there’s no argument that automatic transmissions shift significantly faster than humans can. As the world progressively “shifts” into two-pedal-only transmissions, Porsche themselves have seemed to embrace this automotive trend by sticking another speed into their PDK system. The 2020 911 will be the first of the 911s fitted with this new PDK transmission. We’ll see how reliable it is! While technical specs are limited at this point in terms of engine displacement or torque production, major publications are reporting that the 992 produces about 23 more horsepower compared to the current generation of the 911. This is most likely due to improvements in turbo efficiency, in addition to a larger intercooler and redesigned fuel injection system. If there’s one thing the Deutsch are obsessed with, it’s efficient engineering (and we love it). Going back to transmissions, unfortunately, the 922 won’t be available in a true seven-speed manual for a little while, as the first 911 Carrera S and 4S variants to hit the market will be equipped with the eight-speed PDK system. In the world of sports cars, width generally translates to aggressiveness in both looks and handling. Porsche has incorporated this in the new 911 design, as the front body width is stretched by about 1.7 inches. The rear is an extra 1.4 inches wider, and to help reduce the extra weight with more…well, car, the bodywork in the new 911 is now completely aluminum-based. Porsche continues to make interior improvements in their line of vehicles that make the driving experience that much more pleasurable. The brand has always done a great job at combining luxury and performance, and that’s evidenced with the new 922 generation 911 adopting some of the interior upgrades pioneered by the Panamera and Cayenne. There’s an analog tachometer in the front and center of the driver’s view, with digital screens on both sides providing the driver with everything else that they need to know (and could ever wonder about). Like most (nearly all) new cars these days, there’s also a giant screen in the center of the dash between the passenger and driver that lets you control almost everything. As for the best interior improvement of the newest 911? There’s a real cupholder up front! That’s right; it’s not one of those crappy, flimsy ones. It seems that the Europeans have finally embraced the American way of the mobile soft drink. That’s all for now. Thanks for stopping by! Whether your Porsche is new or used, clean or dirty, we’ll happily service it with a smile on our faces. It’s all part of our commitment to you as our customer and fellow Porsche lover. Schedule an appointment today with HOUSE Automotive for genuine, independent Porsche service in Los Angeles. Read More Porsche News And Content Here!